Bring your chairs and blankets, and come enjoy great local music every Friday night this summer at the LIVE at The Mayfair Collection Concert Series! Presented Synergy luxury apartments and Meoimi Coastal California Wines, the concerts are free to the public and will feature a different local artist / musician every week. Guests can enjoy the music out on the lawn in the plaza with beer, wine, and cocktails available for purchase from Taqueria El Jefe’s new outdoor bar! 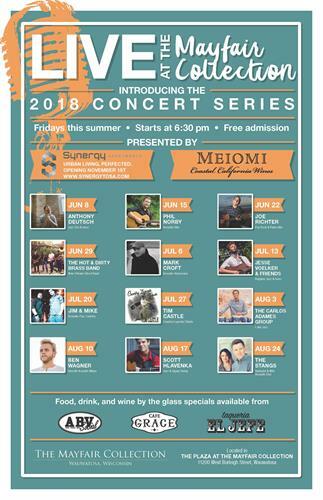 The LIVE at The Mayfair Collection Summer Concert series is presented by Meiomi Coastal California Wines which will be available for purchase at Taqueria El Jefe’s outdoor bar.